Looking for movie tickets? 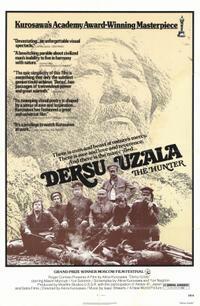 Enter your location to see which movie theaters are playing Dersu Uzala / The Seventh Seal near you. DERSU UZALA, When Captain Vladimir (Yuri Solomin) and his Siberian forest expedition meet a diminutive mountain man, Dersu Uzala (Maksim Munzuk), at their rural campsite, a friendship begins that will span decades. Kurosawa perceptively and subtly explores the inevitable clash of civilization and nature, focusing on a relationship between two men who are very different yet share a kindred spirit. In Russian and Chinese with English subtitles. <br><br> THE SEVENTH SEAL (DET SJUNDE INSEGLET), 1957, Janus Films, 92 min. Arguably Ingmar Bergman’s most iconic film and the movie that helped create the international arthouse cinema craze of the 1950s. While the Black Plague rages all around, medieval knight Max von Sydow plays a game of chess with Death … but who will win? Often imitated and parodied but never equaled, THE SEVENTH SEAL is an astonishing, protean masterpiece: a film to storm the gates of Heaven with. In Swedish with English subtitles.